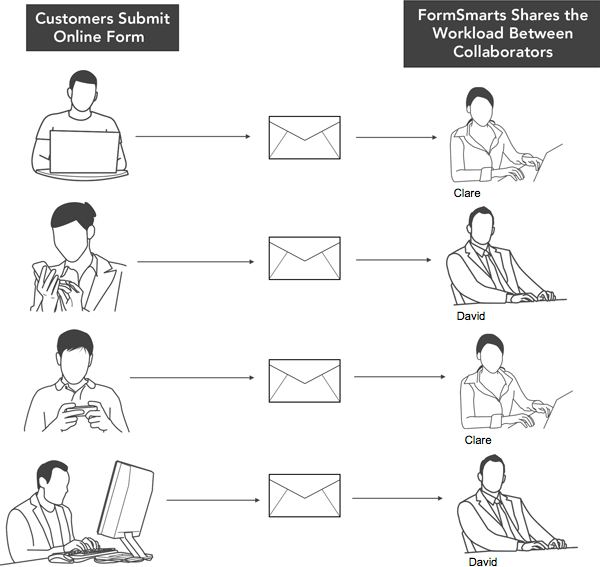 As part of FormSmarts collaboration features, we’re introducing Routing Policies. Routing policies allow you to change the destination email address of a form each time it is submitted, depending on certain criteria. Until recently the only option was for each email subscriber to receive a copy of the notification message when a form is submitted. FormSmarts now also supports alternative behaviors. 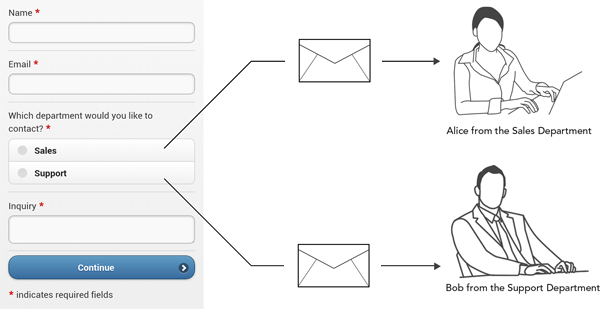 With User-Selected Recipient, users select to whom the form response is sent from a list on the form. For example, a company might want to allow its customers to submit both sales and customer support inquires online. Customers should be able to choose on the form whether their inquiry is sent to the sales or customer support department. With Round-Robin, form entries are sent to email subscribers in turn, thus automatically sharing the workload between collaborators in a team. In the example below, four customers are submitting the same online form. The form was set up for round-robin routing between two colleagues, Clare and David. The first time the form is submitted it’s sent to Clare, the second time it’s sent to David, then to Clare again, then to David again, and so on. This short video shows how to set up a routing policy. Posted by FormSmarts on May 6, 2015 at 12:49 pm in collaboration.